"Laughing in the face of stupidity"
h.Art is Herefordshire's Open Studios tenth event, giving you exclusive access to artists' studios, workshops and special exhibitions. This year there are 103 fantastic venues spread across the whole county and borders. It is the perfect opportunity to meet the makers in relaxed surroundings, learn about their techniques and inspiration and perhaps buy a print or an original artwork. 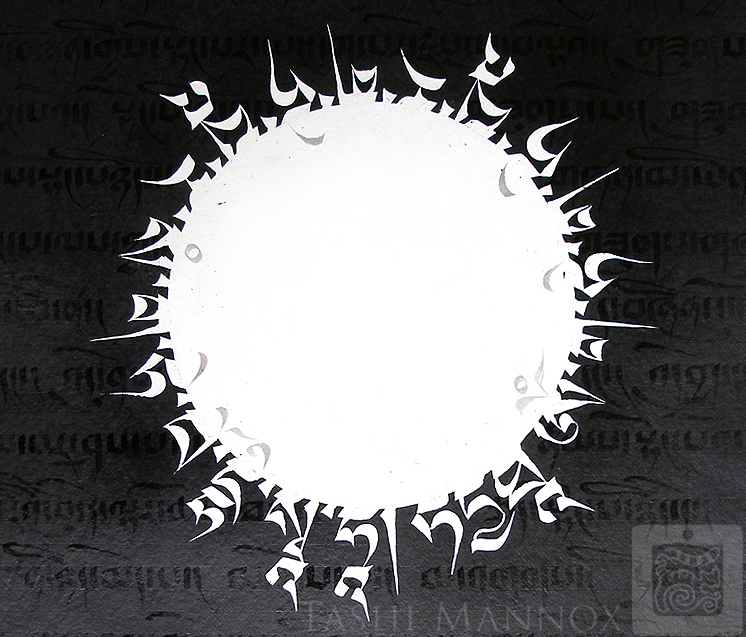 For the first time Tashi Mannox exhibits in his home county Herefordshire. 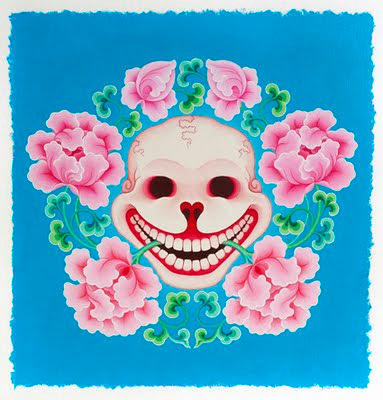 This will also be a première showing of his striking set of five "Laughing in the face of death" paintings as well as other first editions from his illuminated iconographic series, of which have been beautifully replicated as more affordable limited addition giclée prints. There is an opportunity to meet Tashi personally during the exhibition opening on Saturday 10th September, 7pm-9.30pm. To see details of this exhibition and other Herefordshire art events, please follow the link here. If you are unable to visit the exhibition and would like to order limited addition prints, there is a wider range of prints in different sizes available via the Tashi Mannox website. Hand gilding a print with genuine gold and silver leaf. A new book, put together as a tribute for the Tibetan Thangka painting master, Sherab Palden Beru, that was to mark the special occasion of his 100th birthday celebrations, held at the Annual Tea Party, 14th August 2011, of the Kagyu Samye Ling Tibetan Buddhist Monastery in Scotland. 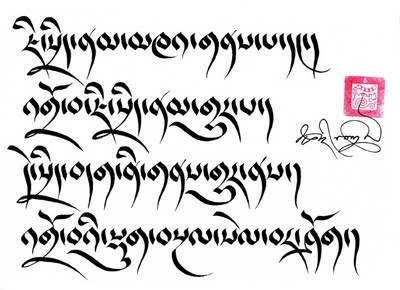 This beautifully illustrated book was complied at the request of Dr. Akong Tulku Rinpoche. Within there is a brief biography, tributes from friends and students, and many illustrations of some of his works, a number of which have never been published before. 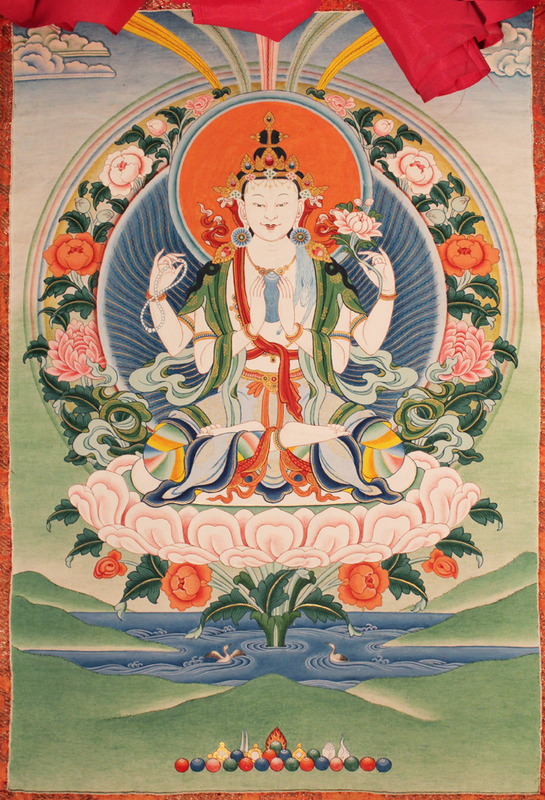 A Thanka painting by Sherab Palden of Chenrézing. 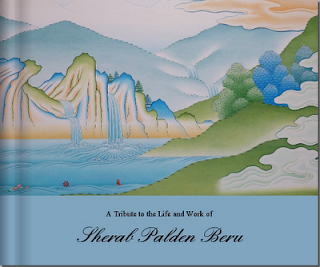 Tibetan Art Master Sherab Palden Beru. 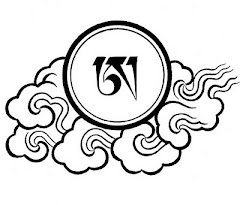 Tashi First met Sherab Palden when he was a boy of 12 years old, who in ore of Sherab's mastery in the Tibetan art tradition, later at the age of 21 became a monk and spent the next 17 years working closely with Sherab Palden learning the art of fine temple decoration and the art of Cham Lama dance. 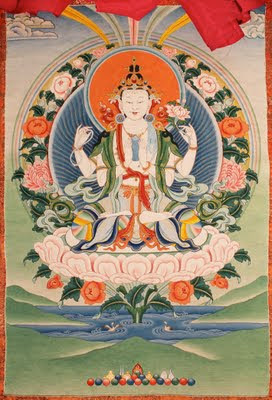 "Sherab's influence on me spiritually and creatively is essential to my own path as an artist and Dharma practitioner. 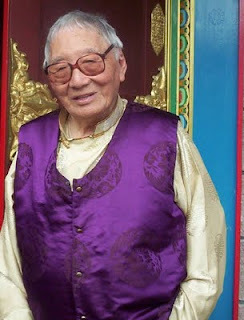 Without his knowledge and great warmth of heart, I would not be the person I am today. I feel deeply grateful to Sherab and with the tireless direction of Akong Rinpoche, it is a credit to both of them for my well-being and success"
Sherab Palden, Tashi Mannox and Akong Tulku Rinpoche. 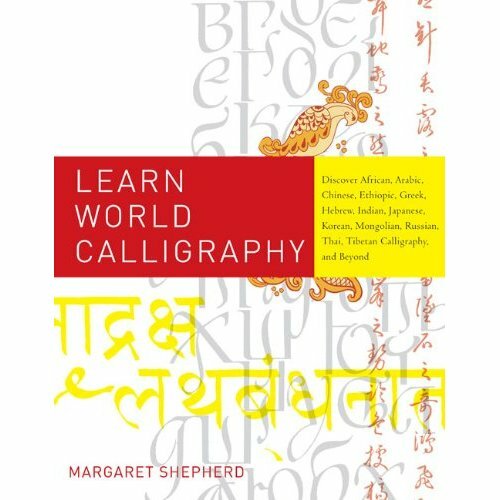 To Order a copy of this book, please follow the link here. Bodhicitta prayer in drutsa script. 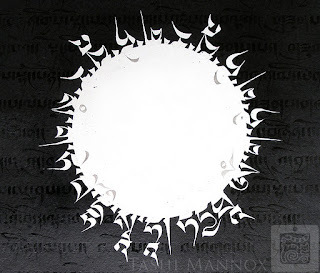 Tashi Mannox 2011. 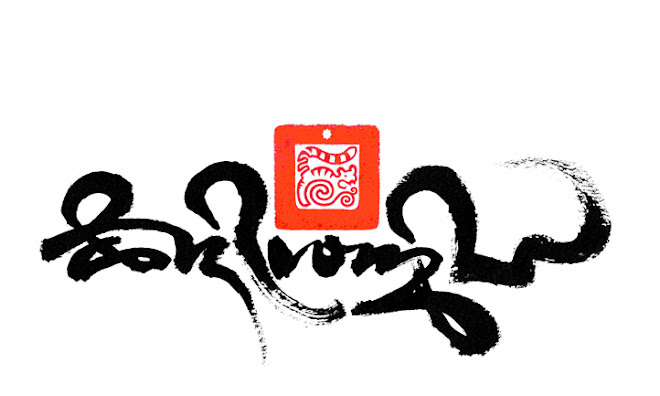 "For as long as space exists and living beings endure. May i too remain to dispel the misery of the world"